Gregory went out for one last dive this morning to say au revoir to his dogtooth tuna friends. A bittersweet departure yet both parties were still smiling. As we lifted anchor and set sail towards Fakarava it wasn’t only the dogtooth tuna that haunted Gregory’s fishing dreams. The elusive, and possibly completely fabricated tales of abundantly available lobster loomed heavily and frustratingly on his mind. The lobster search started way back in Hiva Oa, and really ramped up come our arrival here in the Tuamotus. The story goes that they’re ripe for the picking on the outer reef shelf in the dead of the night. By all accounts, lobstering is made to sound as easy as raspberry picking in your Mom’s backyard garden. Alas, that was not the case, though Gregory gave it an honest effort. On three separate nights he set an alarm, geared up in old, sacrificial running shoes for plundering along the reef, and set out in the beam of his headlight. I, regrettably, could never be torn from the warm, comfortable confines of my bed, though Andy was easily talked into the hunt on more than one occasion. Each time the story went somewhat the same. After safely landing the dinghy, Gregory would walk across the motu to the outer edge and wade into knee, to waist deep water. Then began the headlight scanning for anything dark and lobster-like. As if they were in on the joke, every night the lobsters would offer up one of the smallest of their kind early in the search. The guys would come across this too-small-to-bother-with specimen and spirits would soar with the belief that tonight would be the night they scored the big lobster haul. With this successful early sighting they would be buoyed with hope to search fruitlessly for another two hours. Not even the tip of another antennae would be spotted and they’d return empty-handed and fooled yet again. The setting moon. One of the many perks of night shift sailing – getting to take in the world’s equally impressive night time show that beautifully runs unbothered that it’s audience is less than attentive tucked away in bed. 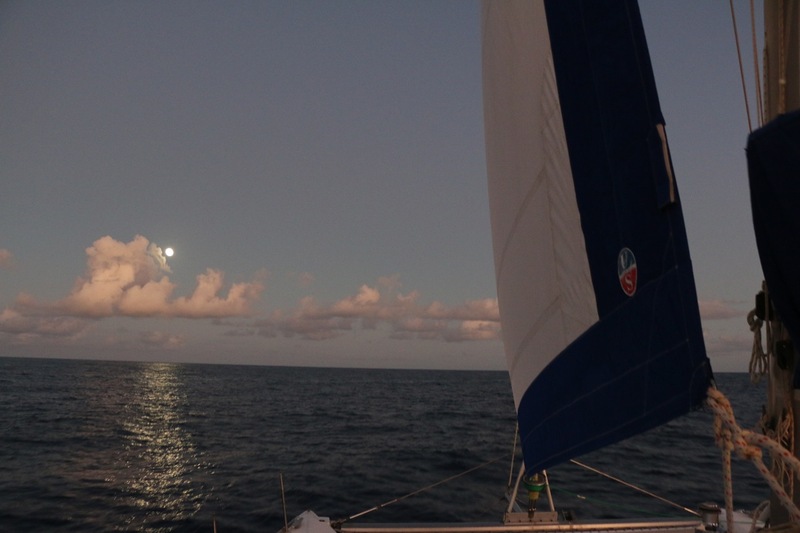 This picture shows the jib at work, although Gregory had the tattered Code Zero sail out for the majority of his final shift during light winds.